What a beautiful shawl. It always amazes me what a difference you can see in the before and after blocking pictures. Dorothy, it’s just delicious! What a beautiful shawl…since you seem to be the queen of shawls, I have a question. I got some lovely lace alpaca from my secret pal. 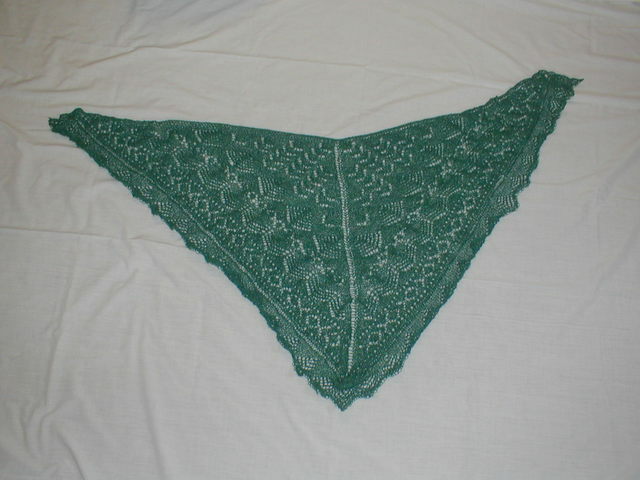 I’ve never done a shawl and would love it if you could recommend a starter shawl for me? Thanks! 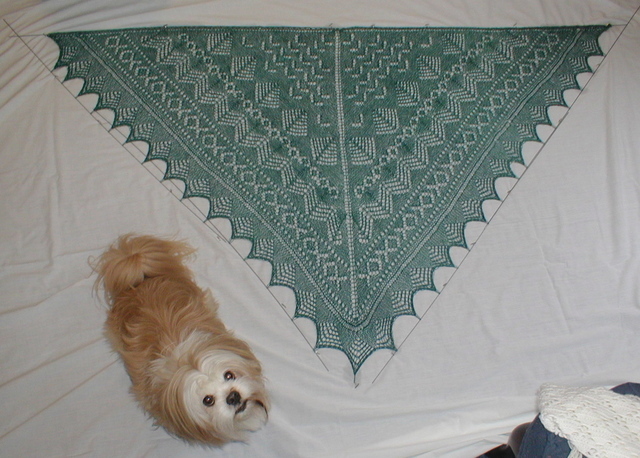 In reply to Lynne’s question about a good starter shawl – I don’t have any specific suggestions. Believe it or not, my first shawl was my own design. I did put two books in the sidebar, though, that have a lot of good ideas, some of them suitable for a first shawl. If you’ve never done lace, the Stahman book is terrific because it has a lot of scarves so you can start out simply. That is lovely! I have that pattern, and yarn for it as well. Is this your first grandchild? What size needles to you like to use for lace? You will love the Wonderful Wallaby pattern. All of my great nieces and nephews just love Wallaby sweaters! I wish I could get a zipper for my lovely Rogue. I must do one of those. Can’t live in Vancouver without a Pacific NW shawl! Beautiful work. That shawl is gorgeous! And who can’t love that fantastic price!